"Arafel": If Israel did nuke The Yemen..
Quote: "Posted by Gerard on July 16, 2015, 6:57 pm, in reply to "NSA File Reveals Israel Behind 2008 Assassination Of Syrian General"
On Aug. 1, 2008, a small team of Israeli commandos entered the waters near Tartus, Syria, and shot and killed a Syrian general as he was holding a dinner party at his seaside weekend home. Muhammad Suleiman, a top aide to the Syrian president, was shot in the head and neck, and the Israeli military team escaped by sea. While Israel has never spoken about its involvement, secret U.S. intelligence files confirm that Israeli special operations forces assassinated the general while he vacationed at his luxury villa on the Syrian coast. The internal National Security Agency document, provided by former NSA contractor Edward Snowden, is the first official confirmation that the assassination of Suleiman was an Israeli military operation, and ends speculation that an internal dispute within the Syrian government led to his death. A top-secret entry in the NSA s internal version of Wikipedia, called Intellipedia, described the assassination by Israeli naval commandos near the port town of Tartus as the first known instance of Israel targeting a legitimate government official. The details of the assassination were included in a Manhunting Timeline within the NSA s intelligence repository. According to three former U.S. intelligence officers with extensive experience in the Middle East, the document s classification markings indicate that the NSA learned of the assassination through surveillance. The officials asked that they not be identified, because they were discussing classified information. http://firstlook.org/theintercept/2015/07/15/israeli-special-forces-assassinated-senior-syrian-official/ " Posts to MediaLens message board. "Netanyahu and Hammond spar over Iran nuclear agreement" Go to: http://www.theguardian.com/world/2015/jul/16/netanyahu-hammond-spar-iran-nuclear-agreement For video. 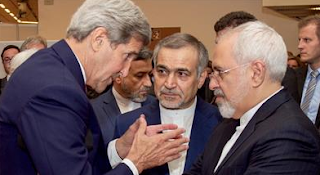 Quote: "Is the Iran Nukes Deal Aimed at Crushing Putin? 264, the last working class hero in England. Posted by Gerard on July 17, 2015, 7:49 pm, in reply to "Is the Iran Nukes Deal Aimed at Crushing Putin?" *War with and subjugation of Iran. Posted by Gerard on July 17, 2015, 8:10 pm, in reply to "Is the Iran Nukes Deal Aimed at Crushing Putin?" You don't think Obama's been forced to play "The Short Game" by Israel's actions? Iran is still nowhere near a democracy although its fundamentalism seems to be fading as I.S rises. How are either China or Russia credible foes? Both are still armed with nuclear weapons. Have The Hawks developed strategies concerning "Limited Nuclear War" again? Is this the purpose of the "softening-up" process re: the use of low-yield nuclear weapons that has been going on? The analysis above presupposes continuity of purpose in American foreign policy and whilst I am well aware just how stringent the efforts have been by the Ubermensch in the U.S to achieve such a thing I am not convinced that their influence is as yet ubiquitous. "The Human Factor" is an unpopular concept for the economic determinist but much that motivates may be excluded from the equation by such attitudes.. "
Also, quote: "Posted by Gerard on July 18, 2015, 8:23 am, in reply to "Is the Iran Nukes Deal Aimed at Crushing Putin?" The scenario whereby Israel is abandoned on economic grounds certainly plays to a "Wider Game" with more oversight and control from the Herrenvolk. Which proxys will they choose to provide the grease on the cogs of the Hux-Wellian faux hegemonic totalitarian oligarchies ("want a picture of the future Winston? Imagine a football boot stamping on a human face.....for about five minutes!" -"Brazil!"-)? I don't disagree about "The Exceptional International" I'm saying do not discount Heisenberg or Khaos."... "I'm sure you are just as interested to find out as I how much The Illumined Ones allow each successive U.S administration to know about their actvities*".." Posts to MediaLens message board (author's posts edited at "Ed's" discretion). *How much does the current one know about the true scope of the activities of companies like Blackwater or Lockheed Martin for instance (go to: http://gkhales.blogspot.co.uk/2012/06/scrap-metal-and-shuttle-diplomacy-in.html & http://gkhales.blogspot.co.uk/2013/01/the-threat-to-amphibians.html)? Quote: "Iran and the global powers have a deal, but what is next? Can Israel’s allies on Capitol Hill derail the agreement? Can we expect the Israelis and the Saudis to respect the process hammered out in Vienna? And most importantly, how does this deal change the geopolitics of the Middle East? Quote: "Iran is edging back in from the cold after years of international sanctions and economic isolation. A deal to curb its nuclear programme is throwing up boundless opportunities for international investors. Potential oil and gas contracts alone are estimated to be worth around $100bn. Investors will also have to contend with the poor state of Iran’s economy. GDP is significantly down, inflation is running at 23 percent and unemployment has risen to a little over 14 percent. The Heritage Foundation ranks Iran 171 out of 186 countries for what it calls economic freedom, while Transparency International has it at 136th place out of 175 countries for perceived public sector corruption. So can Iran allay any reservations foreign businesses may have? How will international investors react? And can Tehran stick to its side of the nuclear bargain?" Go to: http://www.aljazeera.com/programmes/insidestory/2015/07/iran-deal-talk-bomb-economic-boom-150720195018947.html For video.